The Mercedes R 230 series SL is the fifth generation of the venerable sports car, if one does not count the 190SL (this is what Daimler-Benz does). Most of its predecessors have been presented to the automotive world in the month of March at the Geneva International Automobile Show. This time it is different. It happens in July 2001 at the “Deichtorhallen” in Hamburg in Northern Germany. The Deichtorhallen is not just any ordinary congress center, it is one of the largest exhibition centers for modern art in Europe. 500 journalists from around the world have been invited to witness the celebration, where Daimler-Benz presents its new shooting star. Lionel Richie and Juliette, a young German singer, perform the song “The One”, which has been composed by Lionel Richie and Leslie Mandoki for this very event. It is not only the song that is unique. In typical SL tradition, the Mercedes R 230 is unique in many ways too. The most striking feature is its new retractable vario-roof steel hardtop, which is operated by a hydraulic pump and eleven computer-controlled hydraulic cylinders. From now on, the SL carries its hardtop with it, there is no more separate storage for the hardtop needed in the garage. Whether one likes it or not, the soft top is history. A prototype with such a roof had been shown already in 1994. 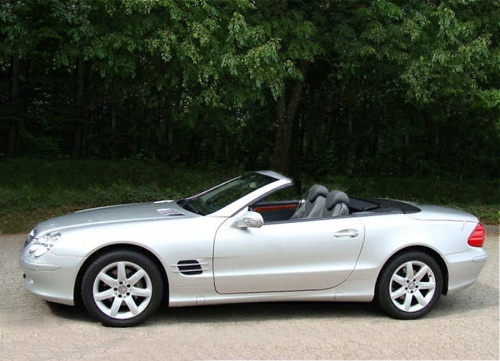 And the first production Mercedes to be equipped with the vario-top is the SLK, launched in 1996. 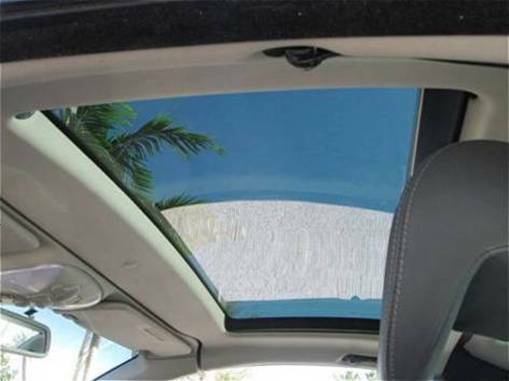 An unusual option is the Panorama glass roof. It can be ordered as an extra for $1,840.- . But not only the soft top is history, also the full-sized spare wheel is not available anymore. In order to maximize luggage space, a tiny spare with a compressor to fill it has to play that role now. 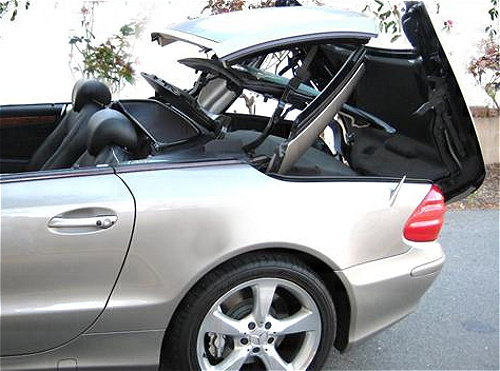 Via remote control or at the push of a button inside the car, the roof can be opened or closed within 16 seconds. The 1996 SLK needs 25 seconds for the same procedure. An extremely complex swiveling mechanism ensures that the three roof components disappear into the upper part of the trunk. Underneath it, 235 liters (8.3 cu ft) of luggage space are available. A small button can be pushed to slightly raise the folded hood again, so a little more luggage space becomes available. With the top up, that space increases to 317 liters (11.2 cu ft), which is 50 liters (1.8 cu ft) more than the R129 had to offer. The design of the Mercedes R 230 is a careful mixture of tradition and modern styling. Ten young designers from Germany, the US and Japan started in 1996 with first drawings. The picture with P. Pfeiffer shows an interesting detail that did not make it into series production: the line that runs along the car’s body on top of the air vents. This line is picked up again in the R231. Part of the long SL tradition comes into play at the front fenders, where the air intakes use a typical feature of the 300SL from the 1950s. The thin, wing-like silver colored segments on these vents are also a reminder of the proud history of the SL brand. 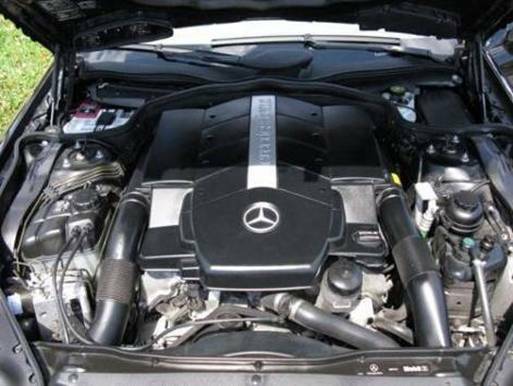 The horizontally elongated radiator grille has always been an unmistakable feature of the SL. 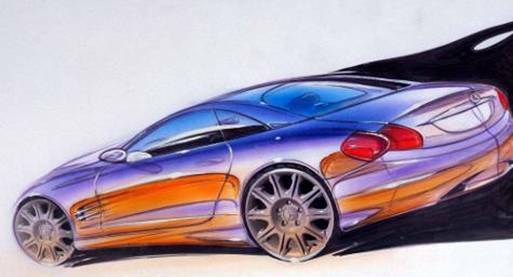 This traditional design is somewhat altered, as the new car shows a more modern, flatter slope than its predecessor, the R 129. Helped by the wind-tunnel dictated wedge shape of the body, it makes the front appear very dynamic. 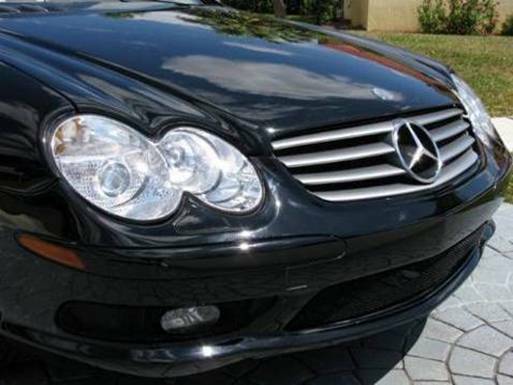 The headlamps carry on with a theme, first introduced in the E-Class W210 in 1995: the “four-eyes” design. In the SL they have been merged into a single unit without giving up their basic oval shape. The long hood takes up the curves of the headlamps and carries them into muscular looking fenders. Another line develops in the lower part of the fenders underneath the air intakes, runs along the doors and connects with the rear bumper. The steeply raked windshield enhances the sports car character with its low, wedge-shaped silhouette. The rear end is characterized by large, triangular-shaped tail lights, similar to the ones of the SLK, which display a uniform red. Special filters in front of the reflectors ensure that the turn indicators still appear yellow and the reversing light white. In order to improve the new car’s fuel economy, parts such as the hood, front fenders, doors, trunk lid and tank partition are made from aluminum. Still, with all the comfort and safety features added, the car is even with the increased usage of aluminum fairly heavy. Depending on the engine and extras chosen, it can weigh between 1.755 and 2.120 kg (4,065 to 4,565 lbs). Fuel economy of the SL500 is on average in the city 15.7 l/100 km (15 mpg), while it improves to 9.8 l/100 km (24 mpg) on highways. A drag coefficient value of 0.29 for the closed vehicle speaks for the sophisticated aerodynamics of body and undercarriage. The R 129 has a cd-value of 0.32 with the hardtop attached. 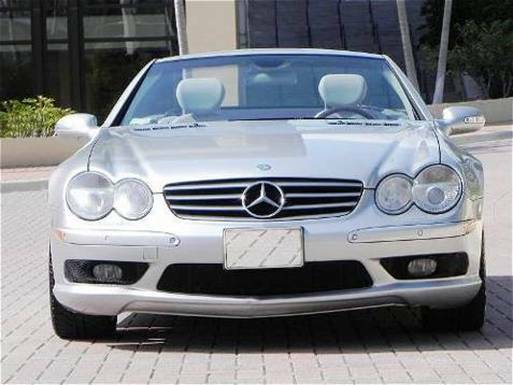 The open-top Mercedes R 230 achieves a cd-value of 0.34 with the side windows up, while the R 129 has one of 0.40. The extensive standard equipment of the SL includes leather-upholstered integral seats, which have a less massive looking aluminum frame than the ones in the R 129. The electric seat and steering wheel adjustment is equipped with a memory function, which is additionally stored in the electronic ignition key. Other standard features are a multifunction steering wheel, automatic climate control and a Bose audio system with CD changer. A long list of options is available to personalize the car, such as the DISTRONIC proximity control system, the COMAND control and display system or an electronic tire pressure monitoring system. A very popular option is the “Sport Package”. With 18-inch five twin spoke AMG wheels, high performance tires and lower body sculpting, it gives the SL the look (but not the price tag) of the AMG SL55. Next to bi-xenon headlamps, also the KEYLESS GO system is a frequently ordered extra. In the shape of a credit card one can place it anywhere in one’s pockets and enter and drive the car without inserting a key into the ignition. To start the engine, one only has to push a button sitting right on top of the gear shifter. The owner has the choice of two types of leather, four trim variants and five appointment colors. Matt-finished chrome rings frame the four individual, classic chronometer-style dashboard instruments. Wood veneer applications can be ordered in walnut, chestnut or black ash. 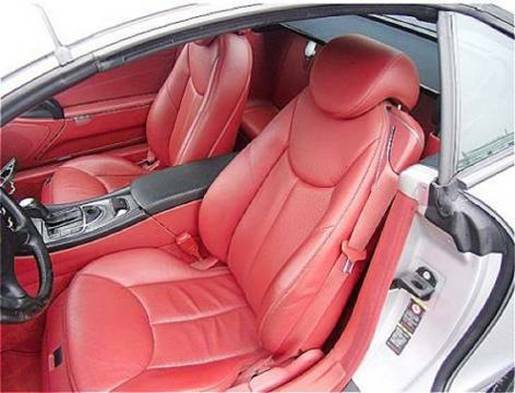 Part of the reason why the SL is larger than its predecessor is increased interior space. It is 5 cm (1.97 in) longer and offers 2 cm (0.79 in) more headroom. While the R129 could still be ordered with additional jump seats, the interior of the new SL is now reserved for just the driver and passenger. 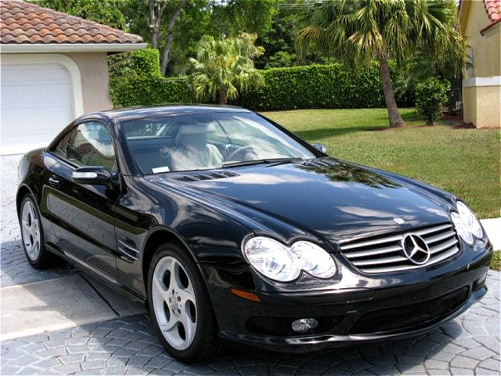 The first model to become available is the SL500 with an output of 305 hp. It is the same three-valve-per-cylinder M113 engine that was already installed in the R129. The alloy-engine weighs only 183 kg (403 lbs) and 90% of its total torque of 460 Nm (339 lbs-ft) are already available at 2,000 rpm. It accelerates from 0 to 100 km/h in 6.3 seconds and achieves an electronically regulated top speed of 250 km/h (155 mph). As with the earlier SL, the V8 is only available with a five-speed automatic transmission with electronic control, two shift programs and torque converter lockup clutch. 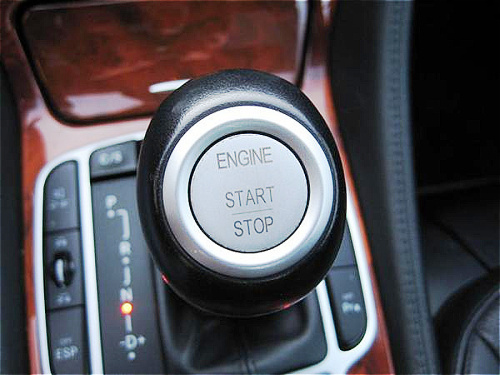 A newly developed touch shift permits very fast manual gear-changes. In Sept. 2003 the transmission is changed to a new, and industry first, seven-speed transmission, called 7G-TRONIC. 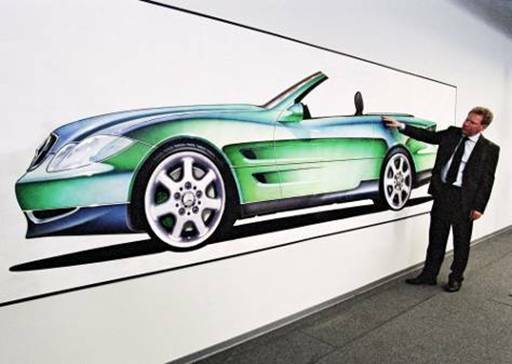 The base price of the SL500 is in Germany 94,308 Euro. While it cost £67,790 in the UK, it is available in the US at $85.990.-. In September 2001 the new SL is joined by the fantastic SL55 AMG. It becomes available in spring 2002 with a supercharged V8 engine, which is based again on the M113. It develops 476 hp, which is a whopping 122 hp more than the previous R129 SL55 had offered. Its 5.5 l (331.9 cu in) engine delivers unbelievable 700 Nm (516 ft-lbs) at already 2,650 rpm and accelerates from 0 to 100 km/h in just 4.7 seconds. That is better than the old R129 SL73 V12 AMG. The engine is mated to a strengthened five-speed automatic transmission with steering wheel gearshift paddles. As people quickly find out, the new Mercedes R 230 series is unfortunately not without its faults. The COMAND interface might have been liked by its designers, but just as the first iDrive of BMW, its supposed intuitiveness is not universally appreciated by the car’s drivers. 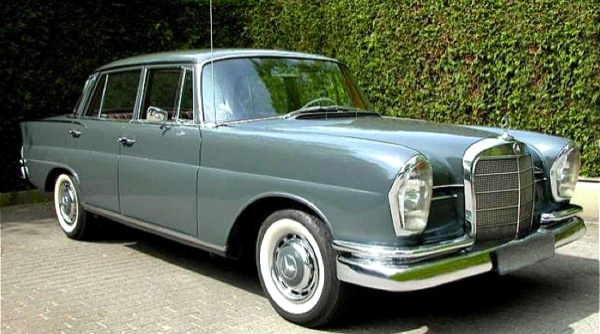 Some see it even after a few years of ownership with a fair amount of frustration and encourage Daimler-Benz (at that time still Daimler-Chrysler) in letters to look to their Japanese competitors for a remedy. Unfortunately the same can be said about the quality of the car. 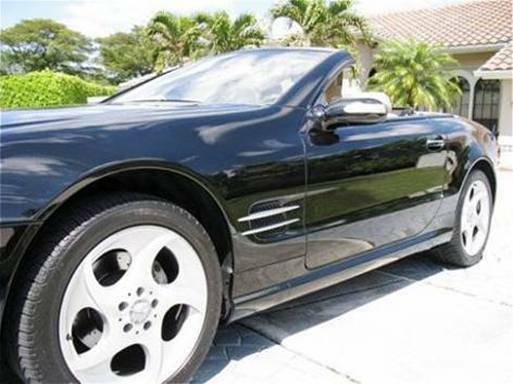 “Consumer Report” in its April 2004 and 2005 editions sees the expensive SL500 slide to the bottom of the reliability chart and as best to avoid as a used car. The April 2005 report on the other hand rates the SL among the highest for satisfaction. 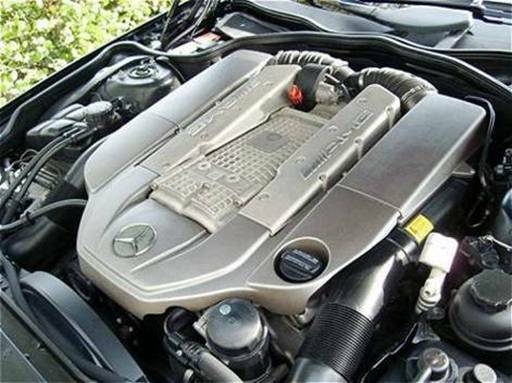 One possible reason for the difference can be that most Mercedes dealers are by now aware of the quality problems, which are not unique to the SL. In the early years of the new century they can be observed with other models of the once iconic brand too. 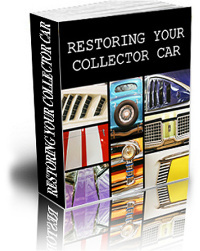 It appears that the dealers try also in their own interest everything possible to make their customers happy again. Many, but not all problems are remedied with the 2006 facelift. 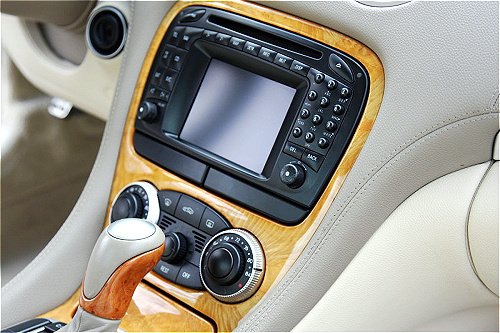 The COMAND interface for example is something, many customers complain about till the end of production of the Mercedes R 230. Another major problem is on the one hand an engineering masterpiece and at the same time a technological overkill, as one car magazine calls it. It was offered next to the SL also in the E-class. It is the electro-hydraulic braking system, called SBC for “Sensotronic Brake Control”. It operates in conjunction with the Electronic Stability Program ESP and the Active Body Control ABC. ABC minimizes body movements and any tendency to skid when cornering and braking. SBC is called by Mercedes technicians the gateway to the future “by wire” systems. It no longer transmits driver’s commands mechanically or hydraulically, but electronically – by cable. More about this feature and everything else regarding the Mercedes R 230, including special edition models and famous tuners such as Brabus, RENNtech or Carlsson, can be read in my e-book and book about the R 230 SL. I hope you will enjoy. Thank you for every other excellent post.I’ve a presentation next week, and I have found what I can add in my speech. Great job! After all I’ll be subscribing for your rss feed and I am hoping you write again very soon!